Southwest Flight 1248 was scheduled for a 14:55 departure out of Baltimore/Washington International Airport, but the aircraft's departure was delayed until 16:50 because of weather. After circling for over 30 minutes the crew were cleared for landing at Midway's runway 31C (6522 feet long). The crew choose to use the auto-braking system at "max". The approach speed was 120 kts and 132 kts by the time it landed. The aircraft touched down with about 4,500 feet of remaining runway. The flying pilot (captain) stated that he could not get the reverse thrust levers out of the stowed position. The first officer, after several seconds, noticed that the thrust reversers were not deployed and activated the reversers without a problem. The reversers were activated 18 seconds after touchdown. Noticed that the airplane was not decelerating normally, both crew members applied maximum braking manually. The airplane departed the end of the runway, rolled through a blast fence, a perimeter fence, and onto a roadway. The 737 collided with some vehicles and came to rest on the corner of S Central Avenue and W 55th Street. A six-year-old boy in one of the vehicles has died as a result of injuries sustained in the accident. PROBABLE CAUSE: "The National Transportation Safety Board determined that the probable cause of this accident was the pilots’ failure to use available reverse thrust in a timely manner to safely slow or stop the airplane after landing, which resulted in a runway overrun. This failure occurred because the pilots’ first experience and lack of familiarity with the airplane’s autobrake system distracted them from thrust reverser usage during the challenging landing. 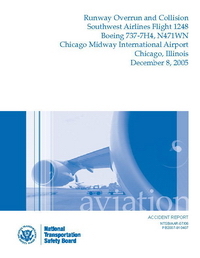 Contributing to the accident were Southwest Airlines’ 1) failure to provide its pilots with clear and consistent guidance and training regarding company policies and procedures related to arrival landing distance calculations; 2) programming and design of its on board performance computer, which did not present critical assumption information despite inconsistent tailwind and reverse thrust assessment methods; 3) plan to implement new autobrake procedures without a familiarization period; and 4) failure to include a margin of safety in the arrival assessment to account for operational uncertainties. Contributing to the severity of the accident was the absence of an engineering materials arresting system, which was needed because of the limited runway safety area beyond the departure end of runway 31C." After the accident the FAA formed the Takeoff and Landing Performance Assessment (TALPA) Aviation Rulemaking Committee (ARC). The ARC provided a forum for the aviation community to discuss landing performance assessment methods. As a result of the committee’s work, the FAA developed a new method for airports and air traffic controllers to communicate actual runway conditions to the pilots in terms that directly relate to the way a particular aircraft is expected to perform. TALPA improves the way the aviation community assesses runway conditions, based on contaminant type and depth, which provides an aircraft operator with the effective information to anticipate airplane braking performance. These standards were adopted on October 1, 2016. Distance from Baltimore/Washington International Airport, MD to Chicago-Midway Airport, IL as the crow flies is 974 km (609 miles).